Do you have a rhubarb patch? I have a huge one that I actually have added more rhubarb too. At the end of the season I cut up 25 cups and put them into bags and into the freezer. Now that I have thoughts of spring again I pulled some out to make these gorgeous Rhubarb Margaritas! We love that tart, unique taste of rhubarb here and one of my most popular posts are Rhubarb Dream Bars. I have also made Rhubarb Strawberry Cobbler, Super Easy Rhubarb Tarts, Old Fashioned Rhubarb Loaf, Rhubarb Strawberry Crisp, Rhubarb Strawberry Sour Cream Pie, Rhubarb Lemonade, Rhubarb Ginger Granola Parfaits, and Strawberry Rhubarb Compote. Tangy and not too sweet is how I like my margaritas! These have the perfect proportions of tequila, lime, Cointreau and rhubarb syrup. I think traditionally you are to use Triple Sec but heck, let’s change this up! If they are not sweet enough for you just add in another splash of rhubarb syrup, make them to how you like them. Don’t forget that lovely salty rim. 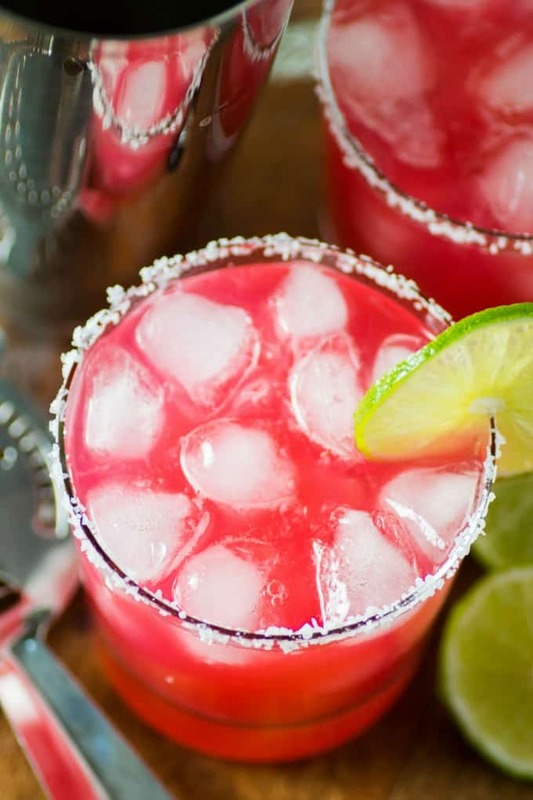 Whether you are watching the game, celebrating Cinco de Mayo, having a Mexican fiesta or want a refreshing cold drink on a hot summers day these Rhubarb Margaritas will fit the bill. Ken and I absolutely loved them. How do you like your margarita, frozen, on the rocks or straight up? I have had them all ways and like them. They remind me of warm tropical breezes in Mexico! I have enjoyed a many margaritas on wonderful Mexican vacations. Look at that luscious color, my rhubarb patch is nice and vibrant. If you are going to plant some rhubarb choose a nice ruby red variety! 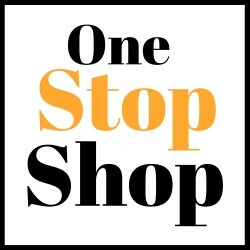 They will make all your recipes just that much more gorgeous! 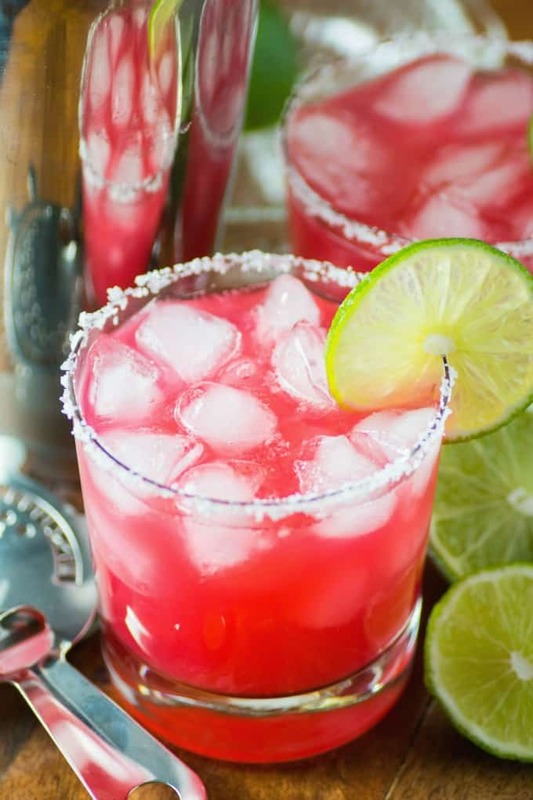 Enjoy this margarita and all of our many rhubarb recipes! Rhubrab Margaritas are a vibrantly colored cocktail and are great at anytime of the year if you have stowed away some rhubarb in your freezer!! 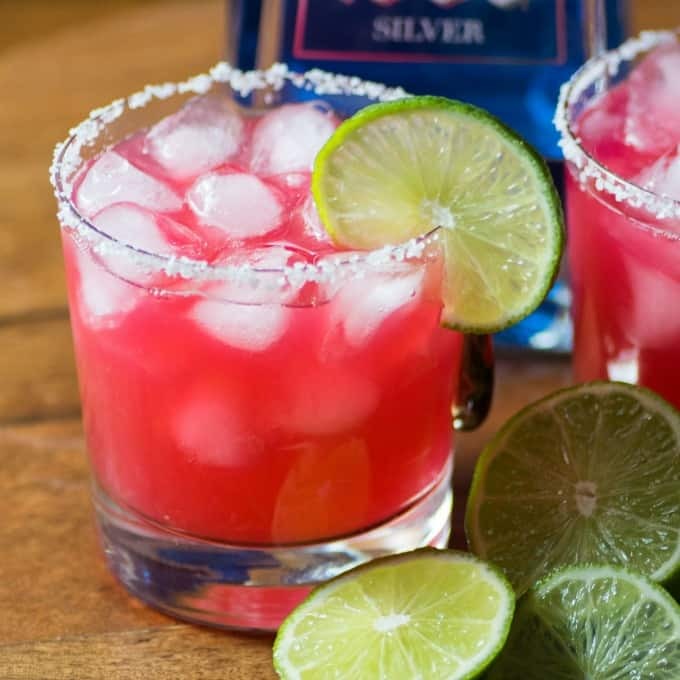 On a small plate squeeze some fresh lime out and turn two glasses upside to moisten the rim. On a separate plate add the salt and rim the glasses with the salt. Fill the glasses with ice. Mix the cocktail ingredients into a shaker on ice. Shake and then pour into prepared glasses. Yesss, I can’t wait to try this! Rhubarb is such a lovely flavor!